Again this year, hundreds of students will crowd campus sidewalks to cheer and high-five runners at the 114 th running of the Boston Marathon, Monday, April 19. (To view photos from last year’s scream tunnel, visit www.runnersworld.com/photo/wellesley/home.html ). For the first time this year, students from the Munger residence hall have created a group on Facebook for runners who can ask to have a sign made and held up as they pass through the Wellesley scream tunnel. The group has drawn requests from all over the world, from New Zealand to Canada. “Such a boost, I turned around and ran through again!” wrote one Facebook member of the tunnel. Students have been hard at work making the signs during a week of spirit and programming in preparation for the race. “There are poster-making parties and a marathon day breakfast,” said Hayley Lenahan, the resident assistant of Munger. “Plain and simple, Marathon Monday is the best day of the year." Wellesley women will also be able to cheer on one of their own as senior Elaina Murray of Topeka, Kan., joins the Children’s Miles for Miracles Team to benefit Children’s Hospital Boston. "My dorm is actually on the route," said Murray, in The Topeka (Kan.) Capital-Journal . "The last three years…rain or shine, I have been out there watching. I decided my sophomore year I wanted to do it as well. I set a goal and decided to run it my senior year." Murray, who hopes to work for Children’s Hospital Boston as a pediatrician one day, is raising funds to help children and families who receive care at the facility. 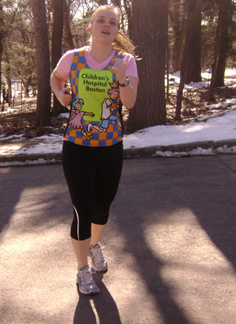 T o help Murray reach her goal of $4,000, visit https://howtohelp.childrenshospital.org/bostonmarathon/pfp/Default.asp?ID=ME0064 . Since 1875, Wellesley College has been a leader in providing an excellent liberal arts education for women who will make a difference in the world. Its 500-acre campus near Boston is home to 2,300 undergraduate students from all 50 states and 75 countries.